On the rare (okay, almost always) occasion that my mom would find some change in time, we would burst out our front door, our tiny fists – quarters and dimes tightly tucked inside – raised triumphantly above our heads. It was always a moment of intense speculation; would the ice cream man still be there and more importantly, would he still have our treats of choice? When we finally made it to the ice cream man, we would slow down, our decision-making skills thrown out the window. To my five-year-old self, choosing the right treat felt eminently important. I’d waver between ice cream sandwiches, rocket pops, and fudgsicles. They were all my favorite and I would always make my brother choose first, just in case I got frozen treat envy. Now that I think about it, choosing and buying treats from the ice cream man was one of the rare things that my mom let us do by ourselves. We felt so grown up, talking to another adult, picking our treat of choice, handing over our change. Yes, the ice cream was sweet, but what was even sweeter was that first taste of independence, satisfying and safe in our little cul de sac. In a heavy-bottomed sauce pan, combine the sugar, cocoa, cornstarch and salt. Add a touch of milk and whisk into a smooth paste. 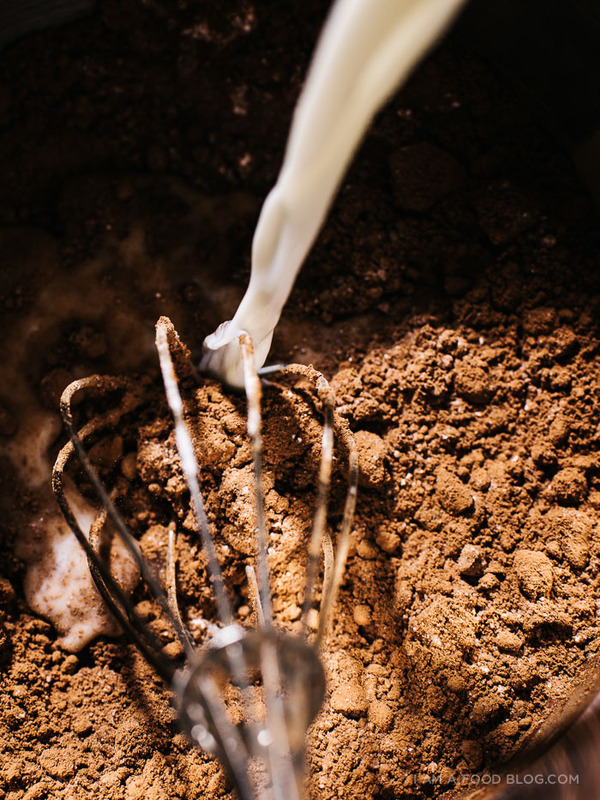 Whisk in the remaining milk until smooth. Bring to a gentle simmer over medium heat, stirring with the whisk or silicone spatula. Continue to heat until small bubbles appear at the edges – continue to heat for 2 minutes. Remove from the heat and stir in the vanilla. Transfer to a glass measuring cup and let cool. Cut or break the brownies into large chunks and stuff into the bottom of the mold so your popsicle stick has something to rest on. 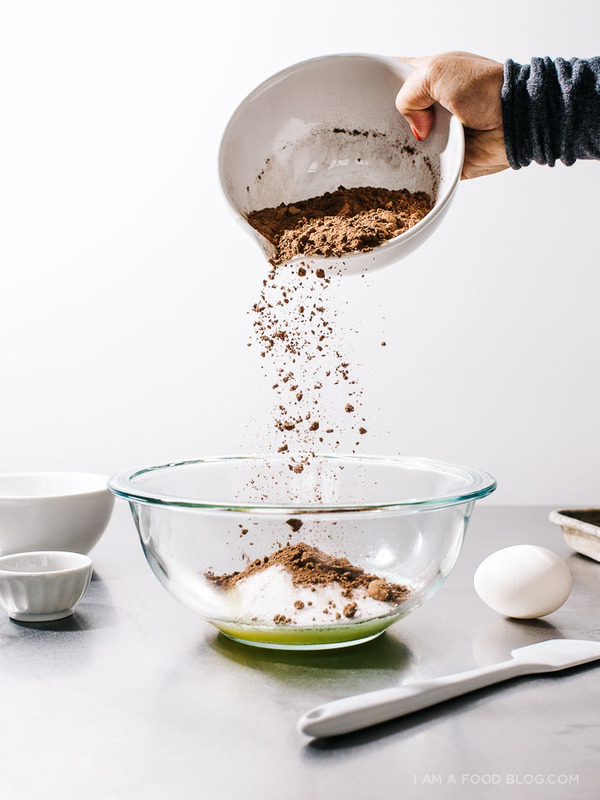 Insert the stick and loosely pack chunks of brownies into the rest of the mold. 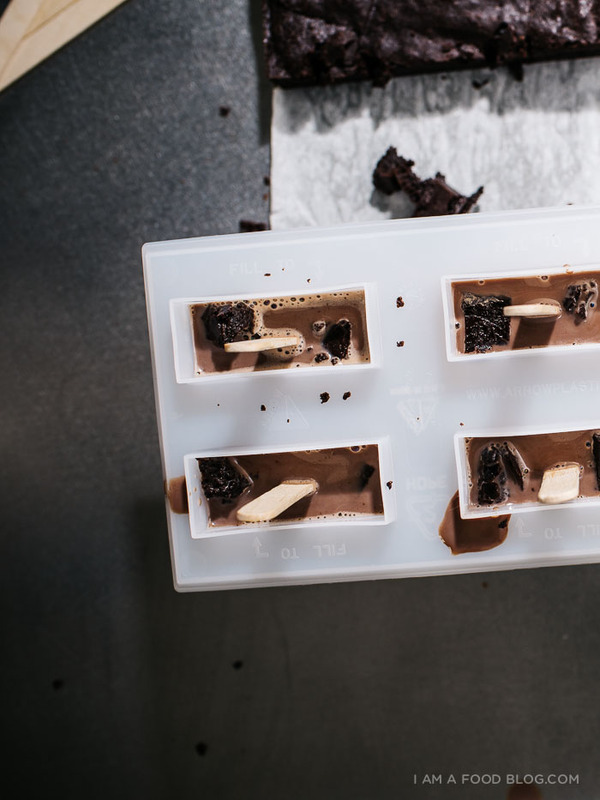 Pour the cooled fudgesicle mixture into the molds. Freeze for 6 hours or overnight. To store, remove pops from molds and wrap in plastic wrap and keep frozen. **I halved my all time favorite brown butter brownie recipe, but you can feel free to make your go-to brownie recipe, or use store bought. 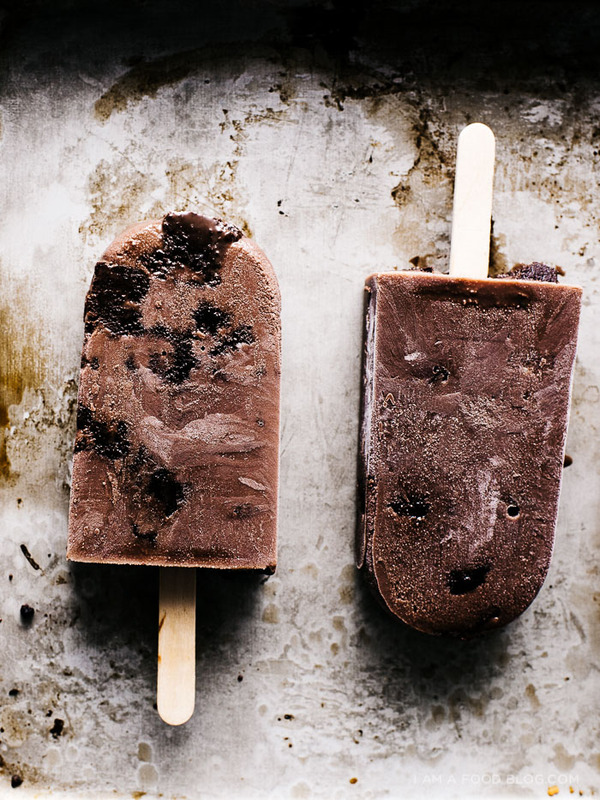 These popsicles are just TOO FREAKIN’ GOOD. I have an empty mold at home which is just waiting to be filled with this gloriousness. These look so super delish and I probably would have eaten 4! 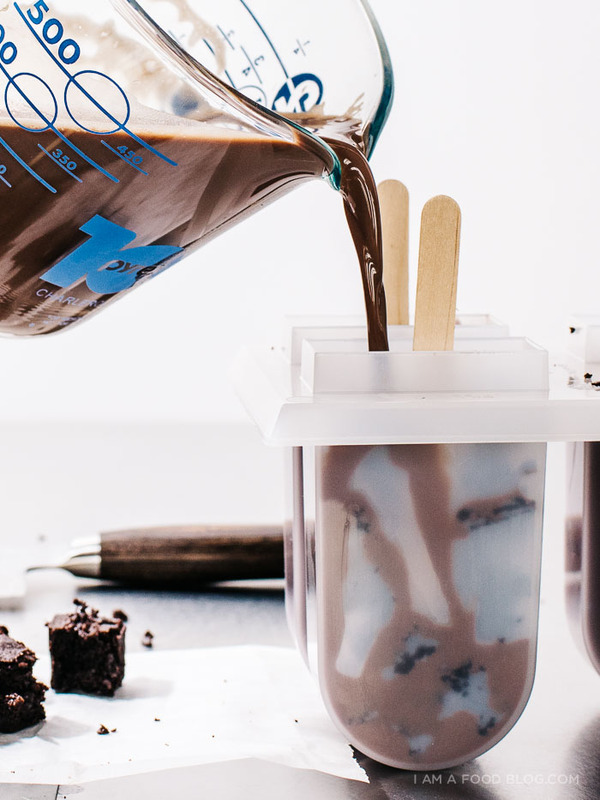 I need all my fudgesicles to have brownies in them…immediately. OMG. OMG, you are too cute!!! That gif of you is just adorable. And your hair is still so blue!!! I love it, just like I love these popsicles! Yes yes yes! 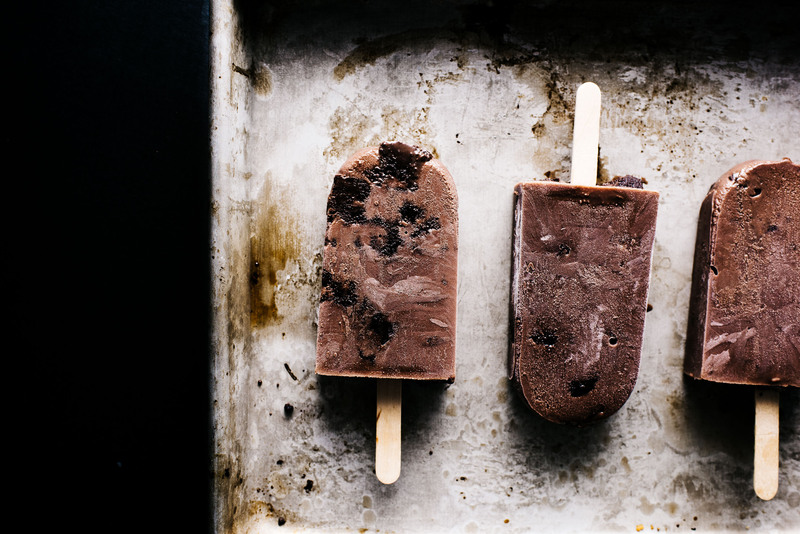 Brownies and fudgsicles in one — so perfect, Steph! As for the ice cream truck, I was always the weirdo that went for the sherbet baseball mitt with the baseball gumball. Who does that!? Umm you are the cutest thing, like ever. omg THIS. that gif!!!!! you are too TOO cute, and you have absolutely captured exactly how i felt about the ice cream truck too! why was it always nerves in addition to excitement? lol. (AND YES ROCKET POPS. also sometimes a pikachu pop. idk.) 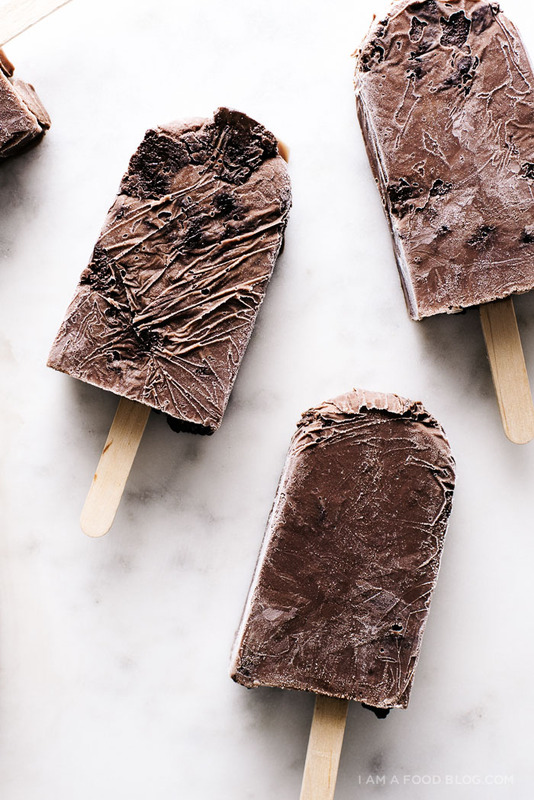 these fudgesicle pops look too good to be true — i need to buy a popsicle mold ASAP so i can make these babes! ERRRRMYGOSHHHHHHH I just want to hug that gif of you, your amazing hair and that popsicle. You’re so squeezable!! 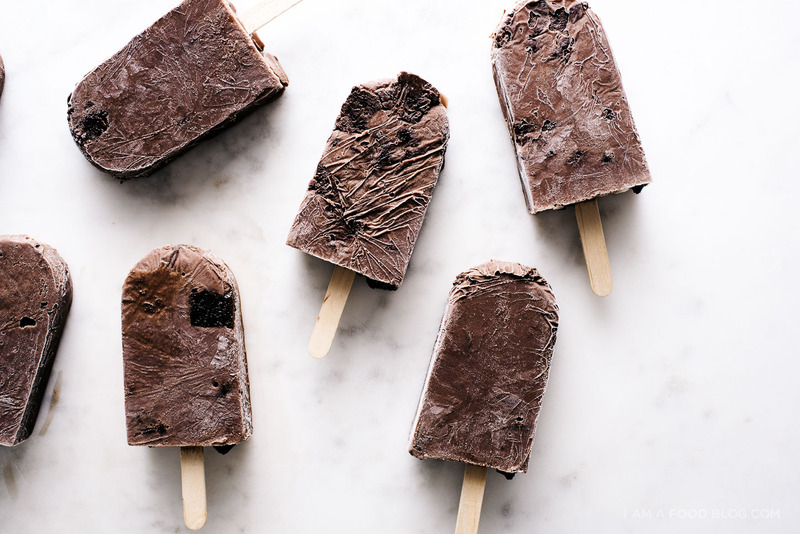 And holy YAYYY for these fudgesicle brownie pops. Love love love them and you and Popsicle Week and Billy and Mariah. sometimes i get bored with one-textured things (ie pureed soups and gasp milkshakes), so these sound perfect! I don’t know how long you’ve been using gifs for your posts, but I’m loving them! They add an extra dimension to the recipes that brings you a little closer to watching it happen right in front of you. I’ve never made my own popsicles, but I’m thinking this year might be the year I give it a try. Oh heck yeah! I love that brownie bits get all chewy and cold when they are frozen, is that weird? Girl you are killing popsicle week! CUTEST GIF EVER and the pops look amazing! I have chocolate envy. Hooray for popsicle week! You’re such a g-darn babe, lady. And these POPS! We actually kind of mind-melded on the pops, but you shall see what I mean any day now! Suffice to say, I love where your head is at. Oh this so awesome! I just made them, but with cookie chunks! 1) You are TOO cute. 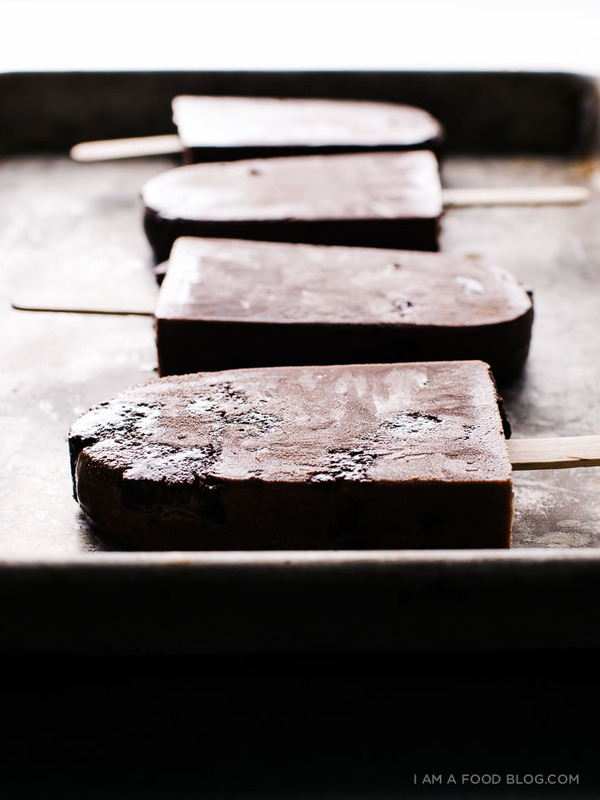 2) Give me fudgesicle brownie pops right this minute!!! Ugh! I want these all up in my face! Also, your gif game is on fleek! Aaaaaand, I totes had a relationship with the ice cream man too. I was really into push up pops. Fudgcicles and brownies?! They look amazing. I love all your GIFs! Heaven on a stick! Must try. This looks so good! I’m adding this to my “to make List”. 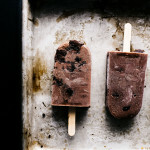 I’m surprised that you can make an ice cream with chunks of fudge brownies. I really like your story about your childhood. I think it’s for every child very important to choose the right treat. One day I will make this brownie pop.